Sleek, nimble, and perhaps soft, Nostramet is a stallion comprised of sloping, entrancing curves and petite frame. The androgynous nature of his confirmation strikes most unprepared for he is both handsome and beautiful, warm and cold, seductive and humble. Traipsing this line with the finesse of a ballet dancer, years growing in a body unrecognizable of a single gender only helped cultivate the fashion in which he emotes. Languid movements grace his every stride with a writhing but fluid motion not unlike that serpents. Most of his height is consumed by the length of his legs, his chest small, hips concave, and nape agile with an evident arch when desired. A petite yet still chiseled visage sits atop it, with eyes large and inviting with long lashes. Nostramet's peculiarities do not end with his simultaneously feminine-masculine form, but continue to express itself in the colors painted upon his flesh. 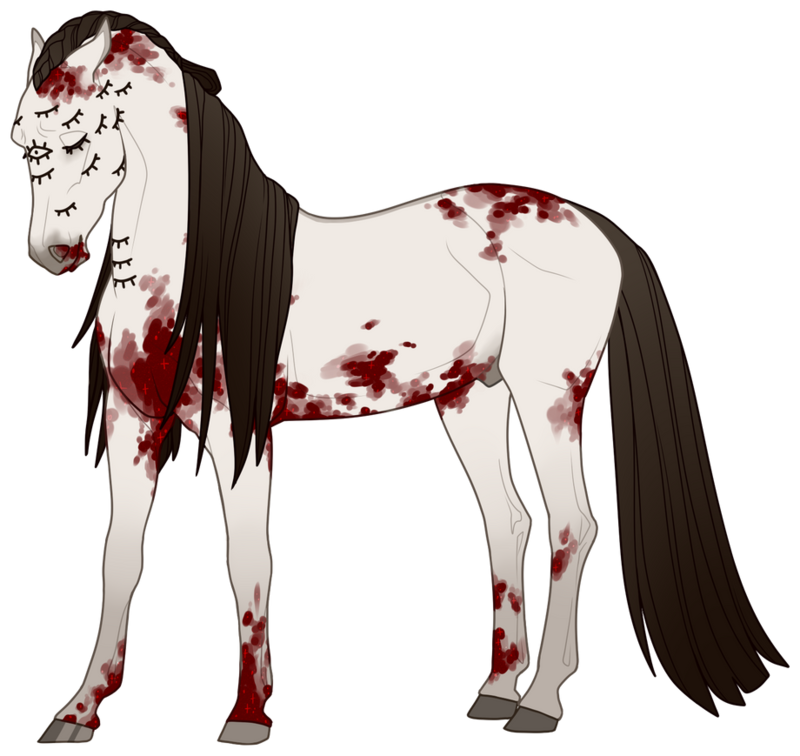 He is best described maximum sabino, the primary of his pelt a sunkissed marble with dotted splashes of deep, blood red. Upon close inspection of these mottled speckles, lighter red, bright and romantic, speckle the pitch of the darker sanguine. The ecru, straight locks that grow along his nape and hind quarters are satin in finish, lustrous when cleaned, and have a natural flatness to them. Even on the most humid of days his threads fail to rise with body, but rather fall in curtains about his dexterous form. They begin almost sandy, as if left too long to bake in the sunlight so the depth of their true umber was sapped, but was the length grows and ages at the tips they turn near-to the pitch of peat. More admiring still comes in the eyes. Not only his natural eyes that are of a silver hue, the pupils of a light concrete so that they are just discernible from silvery quartz irises they swim in. His sclera is of average virgin white and bolster little veins, appearing as if someone had smoothed raw precious gemstones and placed them into his skull. But these are not the last of his eyes... no... Tattoos of ebony litter his visage, upper nape, and throat. They are artificial and not of genotype, but placed upon him from accomplishments garnered in his religious sect. They blink along his jowls, into the crook of his throat latch, and three are placed in a meticulous line along the base of his throat. One unblinking tattoo sits betwixt his actual visionaries, the distinct lashes and pupil the same abyssal black ink that comprised the rest. This singular tattoo only changes upon the use of his magic, where all others may from time to time blink without pattern or conscious effort. As mentioned, Nostramet's tattoos' true change comes when he applies his magical prowess. When calling upon and awakening the dark healing arcane inside himself, the tattoos will fill with that abyssal black void of color that seems to absorb any light upon them. The dot-like pupils turn a bright red and offer a hellish glow. His own eyes adopt a similar aspect as well, the sclera deepening with black stains, swirling until they are all the same jet hue. His pupils contract and his irises deepen with sanguine red, casting doubt and shadow upon a power used to aid and heal those in need. When the glows fade, the healing down, the tattoos will clasp themselves closed again and only begin to blink when his energy is sufficiently restored for further magic.